Villa Lina, a landmark Relais, with 4 mansions each one with acres of beautiful grounds and their own private pool , and a couple of cottages all immersed in 80 acres in the heart of Etruscan Tuscia (with its extraordinary Archaeological and Nature sites (Roman therms & hot sulphur springs close by) in Ronciglione, intact Etruscan, Medieval & Renaissance village). A place of magical energy it is also one of the “Great Italian Gardens"
Villa Lina is also a farm estate producing hazelnuts, kiwis, chestnuts, oil, wine and lavender. 1 hour from Rome Airport, it has inspired generations of artists from poet D Annunzio in the 30’s, painters Sandro Chia & Jean Michel Basquiat in the 80 .. this decade Nick Cave & Bella Freud. Dive deep into the timeless traditions elsewhere endangered, alive and well at Villa Lina that you can taste with flavors, colors, seasons. Relax immersed in the silence & the song of water stroll and bike on the grounds with its many, pergolas, gardens and orchards, exploring the nearby nature reserve of Lake Vico, the hot thermal waters, (both in Nature & at the Viterbo Hotel Terme Dei Papi , re-nowned since antiquity), the intact Renaissance and Medieval village of Ronciglione (VT) steps away. You can rent one beautiful historical villa authentic in each detail with your own private traditional cook or the whole estate. Its large multimedia room (first studio of painter Sandro chia) it is perfect to host yoga seminars , incentives or small conferences. There is a unique plant Therapy course and a small Spa. Mini workshops can be taken in Gourmet vegetarian cuisine, natural cosmetics making, synergic gardening. The bus stop at the gate to Rome takes 45 min. This classical 19th century residence , the largest house of the estate, situated near the main gate closest to the village hosts Relais Villa Lina B&B. It has been renovated as a collaboration between NY designer Ricky Clifton and Paola Igliori, in an extravagant style with various colours creating an ethnic atmosphere (see World of Interiors). Afghan, Indian and Moroccan furniture blend beautifully with the 19th century Italian rooms. The large drawing - dining room restaurant has a grand 16th century fireplace coming from one of the Farnese palaces. Outside the drawing room there is a rustic pergola of grapevine with a long table for cool lunches by the fountain and a barbecue tiled with 18th century Italian majolica. 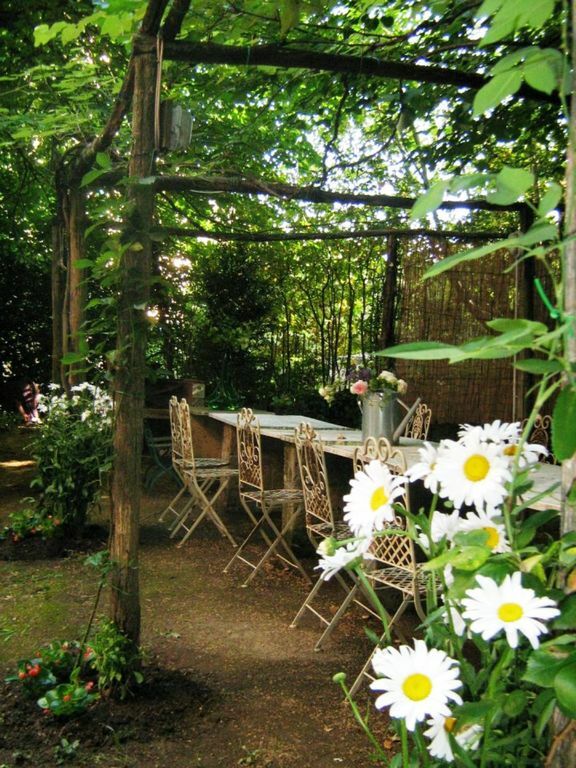 It is surrounded by a large hydrangea garden and ancient oak trees. There is a large circular swimming pool in a field surrounded by centuries old chestnut trees. Fascinating large ethnic suite with intense red tones, king size bed, corner fireplace, living room with a single day Indian bed and a single bed, two windows overlooking the pergola, bathroom with Jacuzzi overlooking the garden of hydrangeas.